JEDDAH: British Consul General Seif Usher hosted a UK All-Party Parliamentary Group on Hajj and Umrah at the British Consulate in Jeddah. At a reception to welcome the group on Sunday, Usher said that the British government was committed to providing the best possible consular service to pilgrims visiting Saudi Arabia each year. “The British consular team works year round to ensure that British pilgrims have a peaceful and trouble-free pilgrimage,” he said. The parliamentary group was led by MP Yasmin Qureshi and Lord Qurban Hussain. Usher also extended a welcome to the Deputy Minister of Hajj and Umrah for Hajj Affairs Dr. Hussein Al-Sharif. “I would like to take this opportunity to thank Rashid Mogradia, CEO of the Council of British Hajjis, and all the other organizations and tour operators for their efforts to support British pilgrims,” the envoy said. Hussain highlighted the challenges, such as travel fraud, facing the UK Hajj and Umrah industry. He welcomed advances in technology to help pilgrims in line with the Kingdom’s Vision 2030 reforms. Rashid Mogradia, CEO of the Council of British Hajjis, highlighted the work of the charity and the parliamentary group in educating pilgrims when booking a pilgrimage package. Recent annual Hajj awards held at the Intercontinental Park Lane London had brought a positive outlook to the Hajj and Umrah sector, he said. Al-Sharif accepted the award for the ministry’s eHajj system. 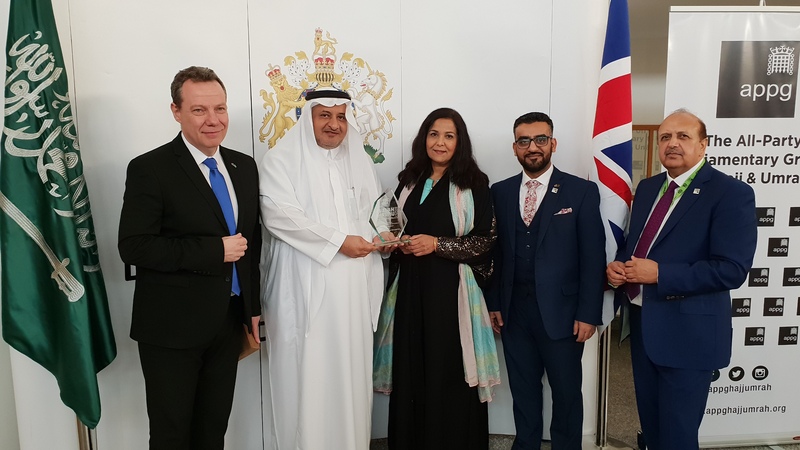 The British consulate in Jeddah collected the best UK public sector award for services to British pilgrims. This article was first published on Arab News.